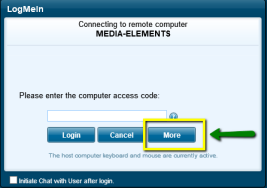 To begin you will need to accept the LogMeIn invite sent to your email address. 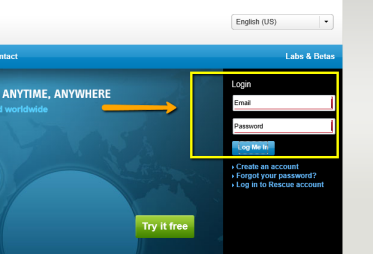 Once you have accepted the invite go to the LogMeIn homepage at http://www.logmein.com. The computer you wish to login to must be on and have power saving options turned off or you will not be able to login to the computer. 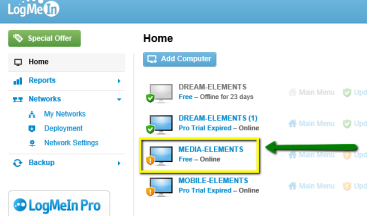 You will need to create a free LogMeIn account using the email address the LogMeIn invite was sent to and login to LogMeIn using your new account. Once you log in you will see all computers which you have access to. Select the computer you would like to access as illustrated in the example below. You will be prompted to enter an access code. Click on the More button. 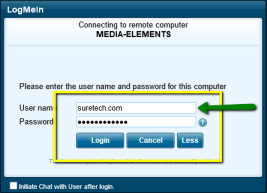 Enter your username and password when prompted and click LogIn.. This username and password is the same username and password you use to login to your computer when in your workplace. You will likely have to select the domain to login to using a dropdown menu. Never select the domain marked as (this computer). Always pick the other domain. Click on Ok to confirm your access. (You can click the check box to remember this setting if you do not want to be promted each time). Once authenticated you should see your computer login screen.